The days before leaving to somewhere are always extra busy. 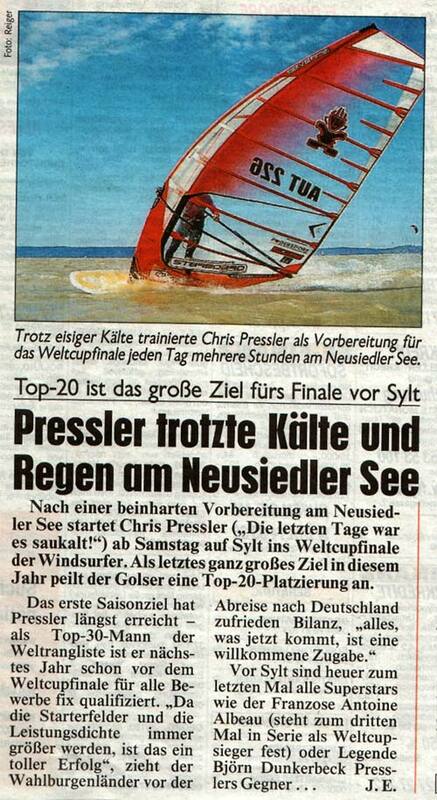 Today one of the biggest Austrian newspapers posted an update about myself – thatÂ´s a media highlight -and the PWA final on Sylt, where the windforecast looks insane. There is a chance to get some waveriding and freestyle done, too. Check it below and will keep you updated from the most northern situated German island of Sylt. Lightwindtraining in freezing temperatures on the Lake Neusiedler while the past weeks (source: Kronenzeitung Burgenland, 23.09.2008). Awesome forecast for the first competition days on Sylt. The first eliminations will be started on the 27th.